Prior to the 2015 IPCPR Trade Show, Casa Fernandez Cigars announced its third installment of the Casa Fernandez Aniversario release. The Aniversario series can be traced back to 2013 when Casa Fernandez released the Casa Fernandez Aniversario Boheme No. 35 to commemorate the company’s 35th anniversary. The Boheme also became Casa Fernandez’s first true limited edition cigar. In 2014, Casa Fernandez followed up with a another limited edition, the Casa Fernandez Anivesario Serie 2014 Ares. Both cigars proved to be home runs and finished as top ten cigars on Cigar Coop for 2014. For 2015, Casa Fernandez decided to release two vitolas – one was a box-pressed lancero called Voleur, and the other is a 6 x 56 parejo called L.F. Celine. With the L.F. Celine, it was the first rounded cigar in the Aniversario line. Recently, I’ve had an opportunity to smoke the L.F. Celine. This cigar continues the excellence this line has offered in the past and delivers an outstanding cigar experience. Each release of the Aniversario has introduced a different size with the blend optimized for the size. Like the previous releases of the Aniversario line, the Casa Fernandez Aniversario 2015 is a limited production run. For the L.F. Celine, there was a production of 1,000 ten count boxes. The Voleur is even more limited as there was a production of 300 sixteen count boxes. 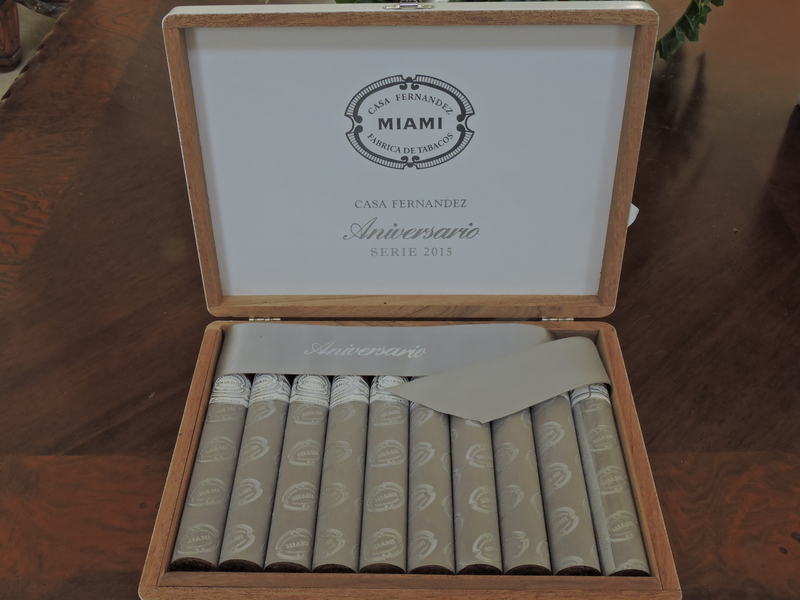 At the time the Aniversario 2015 vitolas were announced, Casa Fernandez stated that this could be the final limited edition for this series and the company is exploring the possibility of making the Aniversario a regular production line. 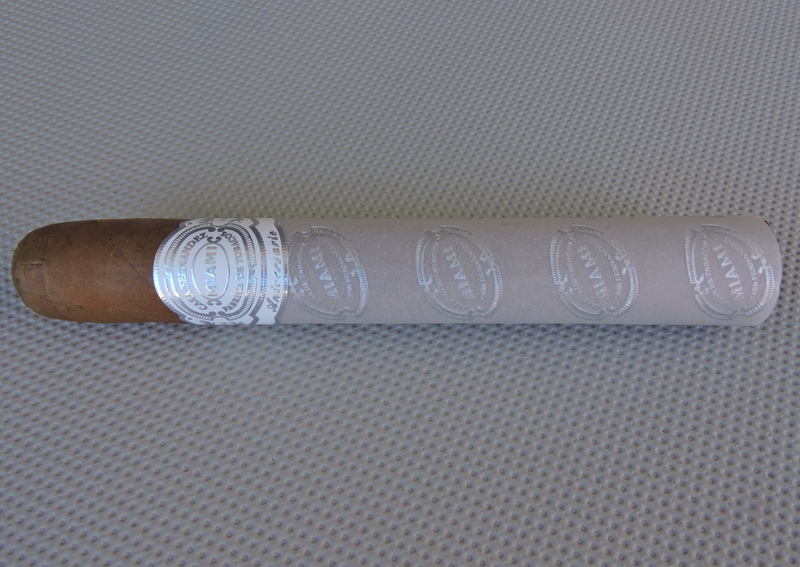 We now take a closer look at the Casa Fernandez Aniversario 2015 L.F. Celine and see what this cigar brings to the table. 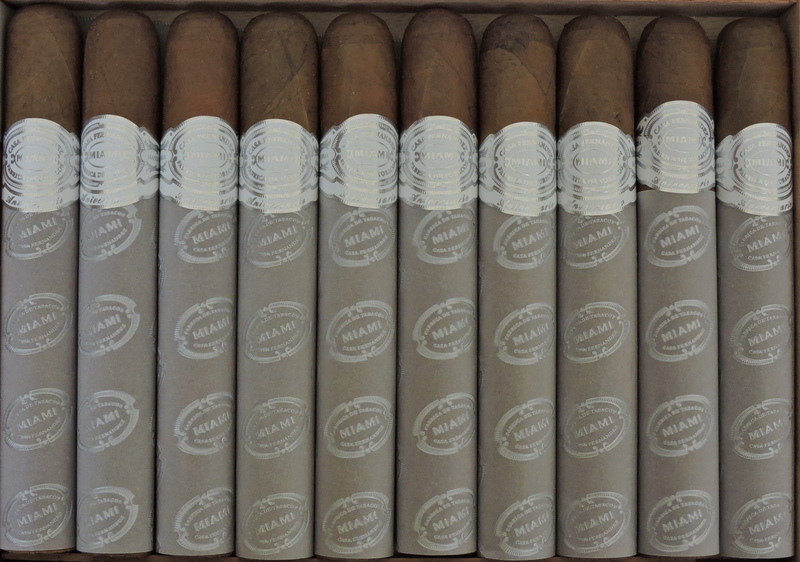 Like its the 2013 and 2014 editions, the two cigars making up the Aniversario 2015 are Nicaraguan puros featuring signature tobaccos grown at the company’s Aganorsa farms in Nicaragua. The cigar is being produced at the Casa Fernandez Miami factory in Miami, Florida. As mentioned, the Aniversario 2015 is being produced in two sizes. The Corojo 99 wrapper of the Casa Fernandez Aniversario Serie 2015 L.F. Celine has a combination of light caramel and rosado color to it. The wrapper itself a very light coat of oil on the surface. There are some visible veins while the wrapper seams are somewhat hidden. The band of the Casa Fernandez Aniversario Serie 2015 L.F. Celine contains a white background and silver font. Prominently on the center of the band is the Casa Fernandez Miami logo. This logo contains a series of concentric ovals. Inside the inner oval is the text “MIAMI”. Above the inner oval is the text “FABRICAS DE TOBACOS” while below the oval is “CASA FERNANDEZ”. To the left is the text “AGANORSA” and to the right is “HAND MADE” Below is the text “Aniversario” in silver semi-cursive font. There are also some silver adornments thoughout the band design. Below the secondary band is a parchment paper sleeve that goes all the way to the footer. On the sleeve is the Casa Fernandez Miami logo in wallpaper mode. After removing the paper sleeve of the Casa Fernandez Aniversario Serie 2015 L.F. Celine, I placed a straight cut to remove the cap of the cigar. Once the cap was successfully clipped, I moved on to the pre-light draw. The dry draw delivered a mix of natural tobacco, floral flavor, a very subtle sour cherry note. Overall, I considered the pre-light draw of the L.F. Celine to be excellent. At this point I was ready to light up the cigar and see what the smoking phase would have in store. The start to the Casa Fernandez Aniversario Serie 2015 L.F. Celine delivered notes of cedar and natural tobacco. In the background I picked up a cherry note that had more sweetness than the pre-light. There also was a slight black pepper note in the background. The black pepper, along with some white pepper notes were prominent on the retro-hale. As the cigar experienced moved through the early stages, the cedar and natural tobacco notes were primary. Meanwhile notes of earth and bread joined the cherry and black pepper in the background. I found the black pepper had a slight lingering effect on the tongue – and this was present throughout the remainder of the cigar experience. Later in the first third, the cherry notes increased joining the natural tobacco notes in the forefront. The cedar notes receded into the background joining the black pepper, earth and bread notes. During the second third, this combination continued, but there also was a caramel note in the background that replaced the earth note. Just before the L.F. Celine moved into the final third, I found the pepper and cedar notes increased. By the last third, these notes joined the cherry and natural tobacco in the forefront. I found the bread and caramel notes had now dissipated. This is the way the cigar experience came to a close. The resulting nub was firm to the touch and cool in temperature. Overall I found the burn of the Casa Fernandez Aniversario Serie 2015 L.F. Celine performed quite well. The burn path remained straight from start to finish. There was some unevenness on the burn line, but this was easily remedied with some touch-ups. Overall I didn’t find this cigar needed an abnormal amount of touch-ups. The resulting ash was on the firm side and had a light gray color. I did find there was some minor flaking from time to time, but overall this didn’t prove to be problem-some. I also found the L.F. Celine had excellent combustion – delivering an ideal burn rate and burn temperature. The draw on the L.F. Celine was excellent. It was a draw that was not too loose, nor was it too tight. Overall this made the L.F. Celine a very enjoyable cigar to smoke. 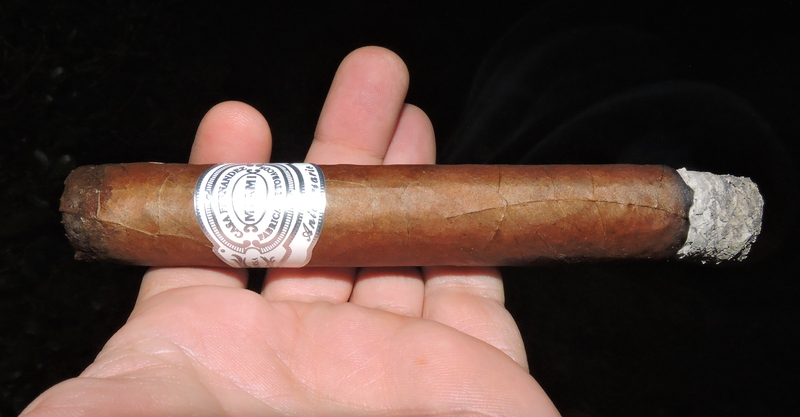 When I smoked the Voluer, I had found that vitola to be a little more dialed back in terms of strength and body compared to previous installments of the Aniversario Series. With the L.F. Celine, I found this one was closer to its predecessors. Overall I assessed this cigar as medium to full strength and full-bodied smoke. There was a a slight increase in intensity along the way, but in the end, the strength and body stayed medium to full strength and full-bodied. In terms of strength versus body, I found the body had a slight edge. 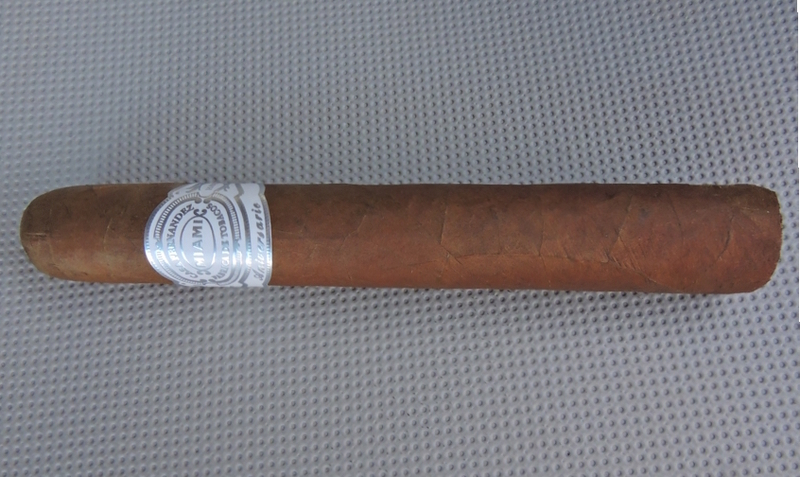 Simply put, the Casa Fernandez Aniversario Serie 2015 L.F. Celine is a home run. This cigar has great construction, delivers excellent flavor, and provides a nice amount of complexity. I found both the rounded format and larger size cigar did justice to this blend. The Aniversario line has established itself as a great series. In terms of whether the Aniversario line becomes an on-going product is still to be determined, but given the quality of this series, I can see the rationale. Overall, this a cigar I’d probably still steer more toward an experienced enthusiast. This is one of the best cigars released in 2015. It’s not only one I’d smoke again, but I’d fight Chuck Norris for a box.